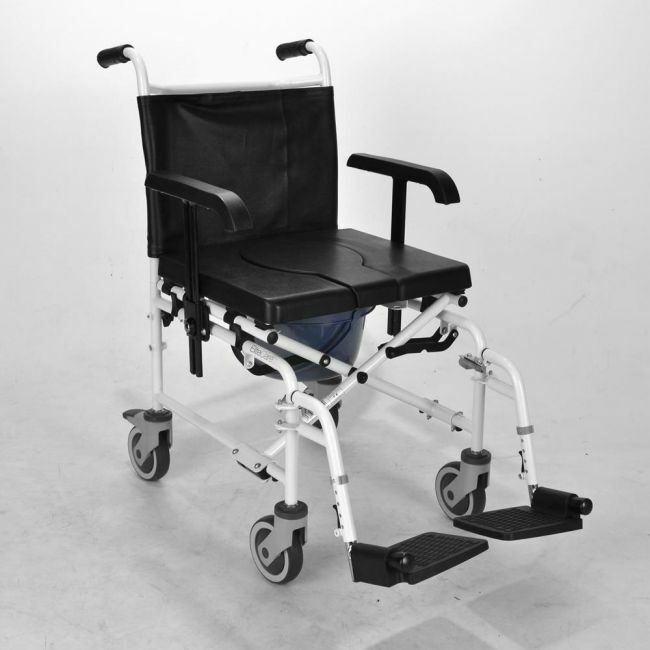 The Elite Care Wheeled shower commode is an attendant controlled commode chair ideal for the home, residential or hospital environments. Made with a strong, robust frame the commode is as comfortable as it is durable. Manoeuvrability is particularly good with the Elite Care shower Commode as it incorporates a push bar and two braked castors making pushing and moving the commode effortless. The armrests are removable, as are the footrests, providing easier access and making transfers simpler for the user and carer alike. All 4 castor wheels rotate fully and the rear 2 have lockable brakes. Armrests are height adjustable and removable for side transfers. Width - 51cm / 20"
Depth - 101cm / 40"
Depth without footrests - 74cm / 29"